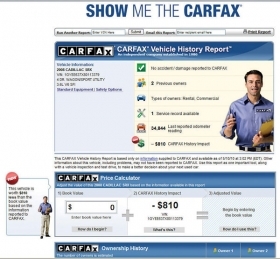 Carfax advertises its reports to consumers. Now it is advising consumers on car prices, and dealers aren't happy. Carfax Inc., known for its vehicle history data, has added vehicle value information to its reports. Dealerships that buy the service are furious. In late April, Carfax History Impact debuted in the vehicle history reports that accompany dealers' used-vehicle listings. It reviews a used vehicle's history and advises that, based on that history, the vehicle is worth more or less than the vehicle's book value. Rob Fontano, digital sales and marketing director at John Marazzi Nissan in Naples, Fla., is irritated. He says he was caught off-guard by the addition. "When did Carfax jump into the pricing game?" Fontano asks. "They've refused to tell us what they're basing it on or what book values. Part of the frustration is we're paying Carfax to add an arbitrary feature on our Web sites that can confuse a customer." Carfax spokesman Larry Gamache defends the product, saying it has nothing to do with dealers' asking prices. He says the adjustment to book values can help dealers hold onto gross profits and build confidence with consumers. Thousands of factors affecting a vehicle's history, such as service history and whether it has been in an accident, are analyzed to calculate History Impact value, Gamache says. The values debuted in January Carfax reports accessible to dealers only, Gamache says. From then through April, the company sent letters and e-mails notifying dealerships about the new values, which derive from "actual sale prices of vehicles with those history attributes," he says. Carfax's field staff team, which calls on dealers, also detailed the change, Gamache says. He adds: "We didn't spring this on anybody." Carfax doesn't plan to drop the program. But Gamache says the company takes the complaints "to heart." A 2008 Cadillac SRX crossover listed last week on the site of Douglas Auto Group in Summit, N.J., was accompanied by a Carfax report that listed an odometer reading of 34,844 miles and no reported accident or damage. The vehicle was reported to have had two types of owners: rental and commercial. Based on the vehicle's history, its price should be $810 less than book value, the report says. Ken Beam, creative marketing director at Douglas Auto Group, which sells Infiniti and Volkswagen, says his dealership pays Carfax, up to $1,300 a month so customers have free access to its reports on his Web site. If Carfax wants to get into vehicle pricing, it should do it on its own Web site, not his, he says. "They don't know what I paid for a vehicle at an auction," says Beam. "What gives them the right to say what I should sell it for?" John Paul, used-car manager at Goodson Acura in Irving, Texas, is less upset. He uses the reports as a negotiating tool. Paul asks customers whether they will accept the deal if he lowers the price by the amount stated in the reports -- and most do. But he, too, says he was caught off-guard when he saw the values in the history reports: "We were shocked and didn't expect it."